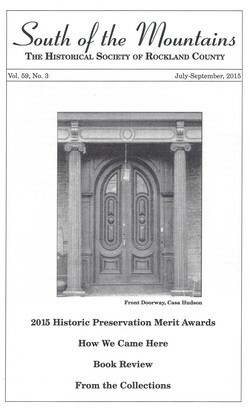 Seven awards in six different categories were given this year at the Rockland County Executive's Historic Preservation Merit Awards Ceremony and Country Supper on May 17. The author, Edward Arens, Ph.D., is Professor of the Graduate School at the University of California, Berkeley. He is Director of the Center for Environment­ al Design Research, the University's research unit for building science and research efficient urban design and also Director of the Center for the Built Environment, an industry/university cooperative research center focusing on commercial and institutional buildings. He lives in Berkeley and still owns a kayak. Your editor reviews America's Greatest Suspension Bridges by Glenn Alexander. Jessica Kuhnen wrote this piece about a Lenape stone grinder when she was Curator of the Collections for the Historical Society from 2008 to 2009. She began working for the Society in 2007 as Collections Assistant, and in 2010 she was Consulting Curator for our Rockland Voices exhibit.